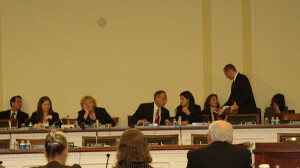 On March 19, 2009, the House of Representatives Judiciary Committee’s Subcommittee on Immigration, Citizenship, Refugees, Border Security, and International Law, chaired by Representative Zoe Lofgren (CA-16) joined by Ranking Member Steven King (IA-5), convened a hearing focused on the U.S. treatment of European Americans and Latin Americans, Japanese Latin Americans, and Jewish refugees during World War II. There were three panels, one for each subject. The hearing was an opportunity for supporters of the Wartime Treatment Study Act (H.R. 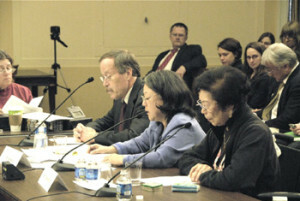 1425) to provide the Subcommittee with historical background on both the Alien Enemy Control Program (AECP) and the Latin American Special War Problems Division, detail the pain and suffering these programs caused to families, and answer questions about related issues. 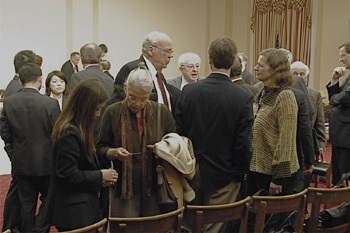 HR 1425, originally introduced by Rep. Robert Wexler (FL-19), would create two study commissions, one to review the U.S. wartime treatment of European Americans and Latin Americans and the second to review the U.S. denial of asylum to Jewish refugees fleeing persecution in Europe. Rep. Wexler attended the hearing showing his support for the legislation. 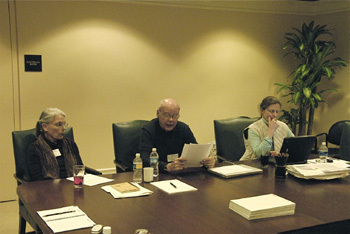 Participating in the European American and Latin American panel were John Christgau, noted expert on the AECP and author, Karen Ebel, President of the German American Internee Coalition and daughter of a former German internee, and Heidi Gurcke Donald, a German former internee from Costa Rica. 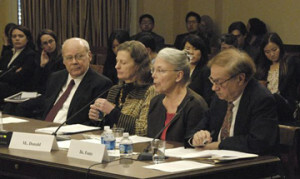 Chairwoman Lofgren graciously welcomed the witnesses and expressed how strongly she believed the historical record should include all those who suffered from U.S. World War II policies, including the Germans and the Italians. The testimony of the witnesses on behalf of the German community was clear, factual and effective. Mr. Christgau gave an extensive overview of the AECP, the enemy alien laws, relocation and internment. 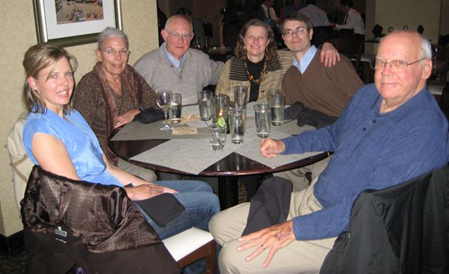 Ms. Ebel provided the subcommittee with a summary of her father’s internment experience and the history of the WTSA. Mrs. Donald discussed the Latin American program and shared her family’s story, relating their harrowing journey from Costa Rica to the Crystal City internment camp and describing the lasting effects their experiences had on her parents. The fourth witness, selected by Rep. King, was John Fonte, a Senior Fellow of the Hudson Institute. Among other comments, Mr. Fonte suggested that examination of U.S. treatment of European Americans and Latin Americans, particularly those of German ethnicity, was unnecessary and inadvisable. The witnesses were questioned most closely by Rep. King and Rep. Loretta Sanchez (CA-47). Both seemed particularly interested in the U.S. military service of family members of internees and the internees themselves. Ms. Ebel, whose father was drafted out of an internment camp, pointed out that the bombardier for Jimmy Doolittle in the Doolittle Raid over Tokyo in April 1942 was the son of a German alien who was interned at Ft. Lincoln in Bismarck, North Dakota, at the time. Rep. Dan Lungren (CA-3) discussed the importance of historical commissions at length. Chairwoman Lofgren thanked the panel for their enlightening presentations. The first panel to present was the Japanese Latin American panel comprised of Dan Masterson, a professor at the U.S. Naval Academy, Grace Shimizu, head of Campaign for Justice/Redress Now for Japanese Latin Americans, and Libia Yamamoto, a former Japanese Peruvian internee. The Jewish Refugee Panel included Valery Bazarov of the Hebrew Immigration Aid Society and David Harris, executive director of the American Jewish Committee, Holocaust survivor and author, Leo Bretholz, and Michael Horowitz, a Senior Fellow of the Hudson Institute. 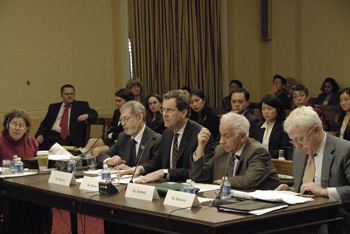 Mr. Horowitz, selected by Rep. King, voiced his support of a Jewish refugee study commission, but quickly turned to a critique of the proposed European American commission. How you can help. Approach your Representative, asking that he/she cosponsor H.R. 1425. Be a squeaky wheel! This is not a partisan issue; a Commission would simply investigate and acknowledge the policies that led to the deportation, internment, and repatriation of civilians of European ethnicity. See Legislative Efforts for more information on the bill and how to contact your Congress members. Let’s get this legislation passed in this session of Congress!